Next time you want a healthy, delicious meal, spiralize. 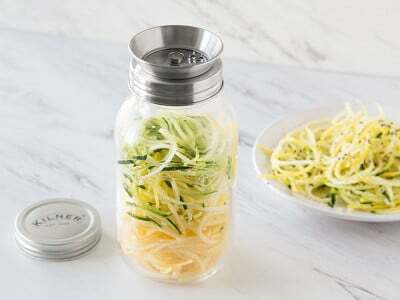 This sleek, stainless steel tool twists hard vegetables into a spiral of strips and conveniently catches them all in a sturdy jar. 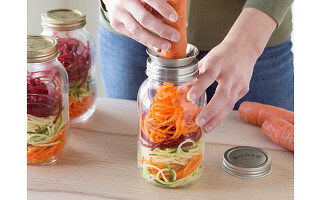 The jar doubles as a handy container that can go straight inside your fridge and lunchbox for on-the-go (and neatly contained) healthy snacks.. With the right ingredients and condiments, these veggie ribbons can be a healthy alternative to pasta that you dress up any way you’d like—from carrots and beets to zucchini and butternut squash. Besides spiraling and collecting your veggies into one streamlined twist, you’ll reap the less-starchy, healthy benefits. 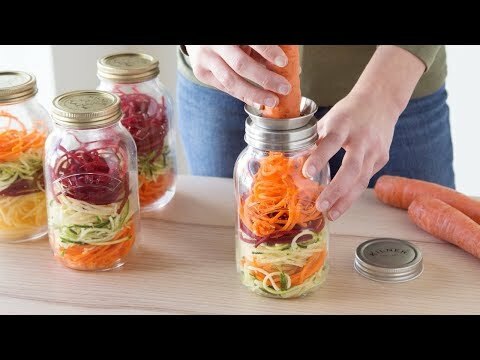 What vegetables work best with this jar? It's great for using with zucchini, carrots, beets, sweet potatoes, and peeled butternut squash. Yes! All components are dishwasher safe. Next time you want a healthy, delicious meal, spiralize. 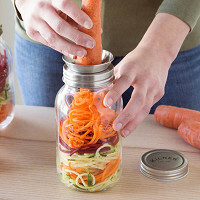 This sleek, stainless steel tool twists hard vegetables into a spiral of strips and conveniently catches them all in a sturdy jar. 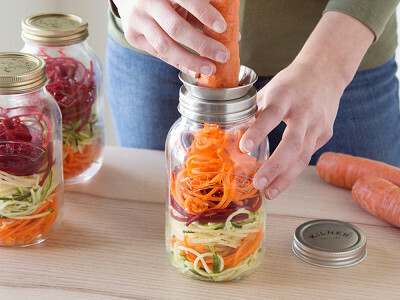 The jar doubles as a handy container that can go straight inside your fridge and lunchbox for on-the-go (and neatly contained) healthy snacks..
With the right ingredients and condiments, these veggie ribbons can be a healthy alternative to pasta that you dress up any way you’d like—from carrots and beets to zucchini and butternut squash.